The Unlikely Homemaker: Simplify the Simplifying-force yourself to go through less laundry! Simplify the Simplifying-force yourself to go through less laundry! I have been "going green" for a few months now. I am also trying to cut back our spending to a very, very minimal amount, while making and keeping household tasks a bit easier. A few months ago, I ran a rope from one side of my side yard fence to the other, and threw a few pairs of jeans over it. 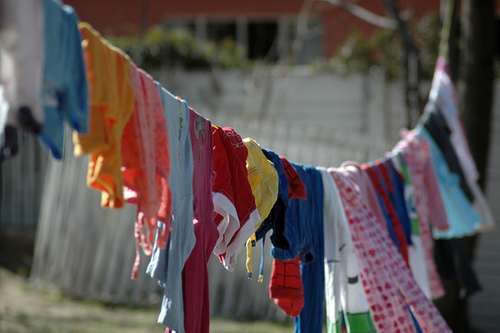 When the clothes were dry, I pulled them off the line, smelled them (I also have this habit of smelling all my laundry. Just to make sure I didn't forget to put detergent in the washer.) and noticed that there was no smell. Lately, because of the heat, my clothes, even fresh out of the dryer, have a little bit of a musty smell. I fell in love with the thought of a clothesline. I bought this one from Costco. If you go into the store, the one they currently carry (for 1/2 the price of the one online) has a tall bar where you can also put hangers. I was happy to read Tsh's post here about line drying. I think it was sent by God, just to let me know he is totally on my side with this new line-drying thing. My hope is that since I am actually hanging all of the clothes up after I wash them, I will think about the clothes I dump in my dirty clothes pile. Sometimes they are dirty, sometimes they are just in my way. What manual tasks "force" you to simplify?